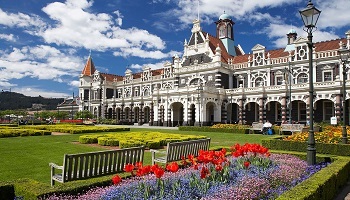 Dunedin is widely regarded as the best preserved Victorian and Edwardian heritage city in the southern hemisphere, boasting many historical masterpieces. The University of Otago is NZ’s oldest university and is home to Dunedin’s large and lively student population. The campus boasts 130 year old blue stone buildings equal to those seen at Oxford or Cambridge. Dunedin is framed by a magnificent harbour. It sits on the doorstep of Otago Peninsula, which has long been acclaimed for its beauty and wildlife. 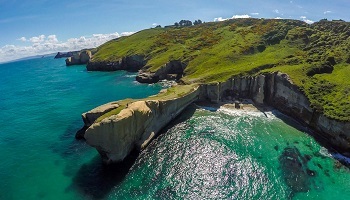 The Otago Peninsula boasts the world’s only mainland breeding colony of the Albatross as well as fantastic viewing of the rare Yellow-Eyed Penguin and other ocean birds and mammals in their natural habitat. The city is a picture postcard of historic buildings and houses, set against a backdrop of the city’s lush greenbelt of native bush. Fondly known as the ‘Edinburgh of the South,’ Dunedin celebrates its Scottish ancestry and treasures its icons. 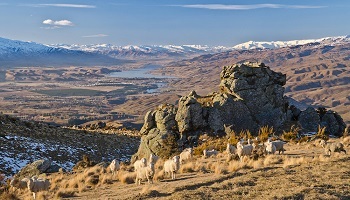 The Central Otago region is the only one to experience a continental climate, having the hottest summers and coldest winters in New Zealand. Old trails that provided access for thousands of miners in the gold rush of the 1860s can still be seen winding over the hills, along with stone cottages, cleverly engineered water channels, mines and machinery associated with the gold rush. Alexandra, the main town on the Clutha River, is the centre for stonefruit, particularly golden apricots. The towns of Alexandra, Clyde, Cromwell, Roxburgh and Ranfurly are ideal bases from which to explore the surrounding historic countryside. Hydroelectric dams along the Clutha River have formed Lake Roxburgh and Lake Dunstan. These now offer a range of recreational opportunities of their own, from power boating and fishing to wind surfing and sailing. Wine has become one of central Otago's newest industries, with many of the wineries still small and offering tastings throughout the summer months.